The Neo-classical Benedum Trees Building was built in 1905 and designed by Thomas H. Scott. The building was commissioned, and later sold, by Caroline Jones Machesney, the society hostess and daughter of a banker. Often her husband, H.A. Machesney, is credited with commissioning the 210-foot structure. She was the first person in Pittsburgh to sell a skyscraper – in this case to two oil magnates named Benedum and Trees. 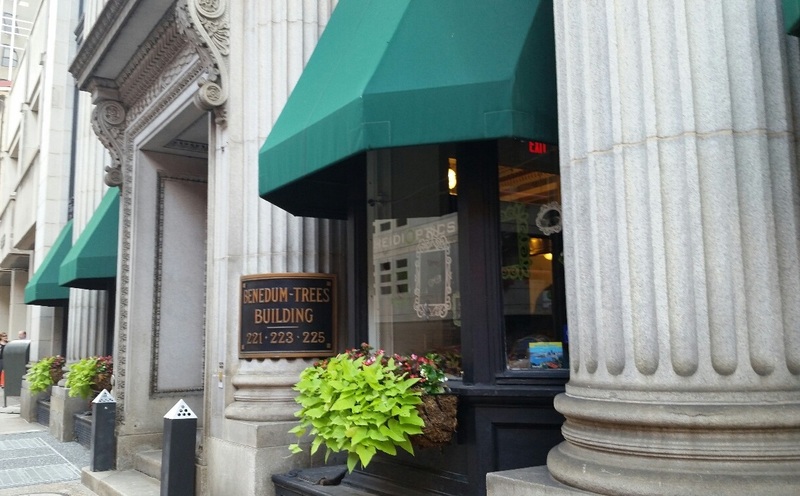 Benedum-Trees Building, at 19 stories tall, was built in 1905. The building was commissioned by Caroline Jones Machesney, the society hostess and daughter of a banker. Designed by Tomas H. Scott, the buildings stands at 19 stories tall. It was originally called the Machesney Building, until 1911 when it became the headquarters of the Benedum Trees Oil Company. For the next 40 years the fifteenth floor was home to the offices of Joe Trees and Mike Benedum.